Jammal Trust Bank and Byblos Bank affirmed their commitment to offer scholarships to eight LAU business and engineering students. 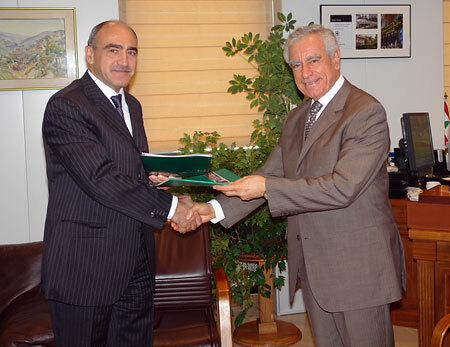 Anwar Jammal (left), Jammal Trust Bank chairman and general manager, signed a gift agreement with LAU President Dr. Joseph G. Jabbra, to offer the Ali Abdullah Jammal Memorial Scholarship to one LAU business student. Rita Chalita and Jihane Khoury (center) from Byblos Bank, surrounded by the business and engineering students benefiting from the Byblos Bank Annual Scholarship Grant this year, and LAU Associate Director of Development Rami Majzoub (1st from right). Two Lebanese banks affirmed their commitment to offer scholarships to eight LAU business and engineering students, during two meetings held at the university this month. Jammal Trust Bank will offer one business student a full scholarship throughout her years at LAU, and Byblos Bank will sponsor 50 percent of the 2010-2011 tuition fees of five business and two engineering students. On October 25, Anwar Jammal, JTB chairman and general manager, signed a gift agreement with LAU President Dr. Joseph G. Jabbra, to offer the Ali Abdullah Jammal Memorial Scholarship, named after Jammal’s late father, Ali Jammal, JTB’s founding chairman. “What’s better than education? You give a person an education, and then with that they should be able to conquer the world themselves,” said Jammal during the meeting, which was held at LAU Beirut. Jammal hopes that at least one of the beneficiaries will feel morally obligated decades later to start a scholarship fund in order to pass on their gift to deserving students. “LAU is growing because of people like Anwar, who kept his father’s legacy,” said President Jabbra. Earlier this month, another major Lebanese bank, Byblos Bank, offered $60,000 toward the Byblos Bank Annual Scholarship Grant to support business and engineering students. The bank contributed the same amount both in 2007 and 2008, in line with the vision of its chairman, Dr. Francois Bassil, to support the future of Lebanon through education. For this academic year, seven students were anonymously chosen from among previous financial aid applicants to receive a sponsorship of half of their tuition. The students met with Byblos Bank officials at the Beirut campus on October 14 and expressed their appreciation for the donation. Rita Chalita, head of Retail Banking and Corporate Social Responsibility, and Jihane Khoury, talent manager, represented Byblos Bank at the meeting, which was organized by the LAU Development Office in coordination with the Financial Aid and Scholarships Office. The two representatives explained the vision of Byblos Bank to the students in terms of supporting the education sector in Lebanon, and talked about internship opportunities at the bank. “It is thanks to generous gifts, like those received from Jammal Trust Bank and Byblos Bank, that needy and deserving students from all Lebanese regions are given a great chance to have access to our university’s academic excellence,” says LAU Associate Director of Development Rami Majzoub.